Another fine performance by the internationally respected musicians of the Orcas Island Chamber Music Festival comes to Lopez for the 7th consecutive year! Artistic Director Aloysia Friedmann presents another brilliant mix of composers and musicians to please every ear. 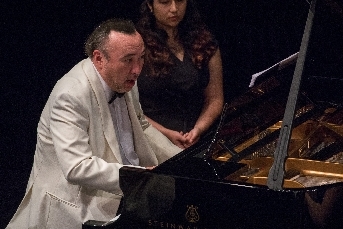 "Music Among Friends" brings familiar musicians back to Lopez along with exciting new faces. Music by composers Franz Schubert, Joaquin Turina, Wolfgang Amadeus Mozart and Johannes Brahms will be performed by Benjamin Beilman on violin, Scott Cuellar on piano, Aloysia Friedmann on violin and viola, Barry Gold on cello, Desmond Hoebig on cello, Toby Hoffman on viola, Jon Kimura Parker on piano, and Carmit Zori on violin. Come enjoy the concert with your friends and neighbors, and meet the musicians after the performance at a bountiful reception. Tickets for the concert performance are available on-line at LopezCenter.org at $27 per adult, $10 per student age 18 and under, and additionally at the venues listed below. At 1 PM the same day at Port Stanley Schoolhouse, the Festival offers a delightful music education seminar "Know the Score" with Jonathan Pasternack, Music Director of the Port Angeles Symphony. "Know the Score" offers musical insights to the evening performance, served with sparkling wit and formidable knowledge. The lecture includes an abundance of finger foods and beverages and is separately ticketed at $25 per adult; music lovers 18 and under are free with a courtesy ticket. Tickets for both the concert performance and Know the Score are available at Paper Scissors on the Rock and the Lopez Bookshop. There are ample opportunities for musician sponsorship for these outstanding performances on Lopez; please respond to lopez@oicmf.org to count yourself among those who help bring these fine musicians to Lopez Island. Two things have been consistent year to year with the Chamber Music Festival activities on Lopez: one, it will change your life and the way you think about music; and two, tickets will sell out well before the concert! For more Festival information, visit: www.oicmf.org. The concert will be followed by a bountiful reception to meet the musicians.